It’s TEASER time! 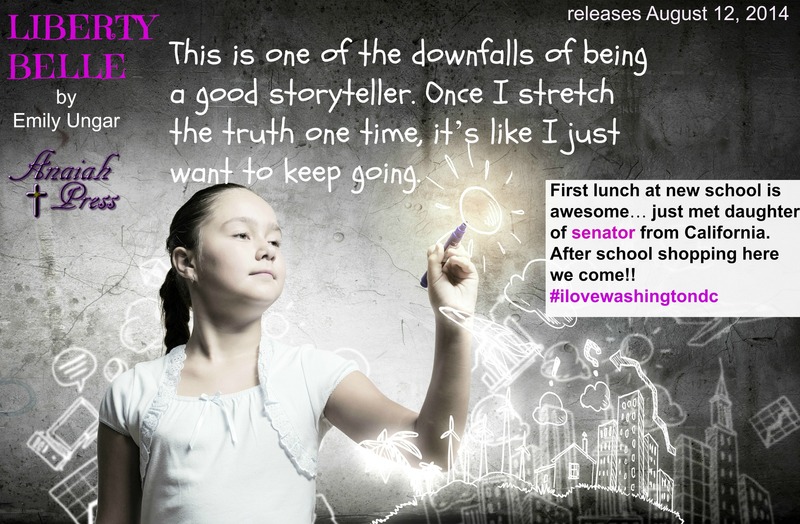 Liberty Belle by Emily Ungar will be released on August 12, but you will have the lucky opportunity to get a sneak peek at her first pages of the book. We hope you enjoy! Today is my twelfth birthday, and I’m in the backseat of our family Subaru holding a dead goldfish. Poor Frank bit it somewhere between Georgia and Washington D.C., and now I’m holding a sandwich bag full of water and the lifeless remains of last summer’s carnival prize. Dad and I wanted to leave Frank’s little body in a nice puddle somewhere along the highway, but Mom pointed out that the moving van would have to stop, too, and we would create a scene. Mom’s biggest fear is creating a scene, and Dad’s biggest fear is upsetting Mom–that’s why I have my lime-green iPod in my left hand and my dearly departed goldfish in my right hand. Oh, and we’ve just moved away from the only house I’ve ever known, on my birthday to boot, so I’m miserable. At least I got a new iPod and permission to have a Twitter account out of the deal. Parental guilt equals appealing personal electronics. I wish I could bury Frank in our old yard—our real yard. Since my five requests to turn around were not accepted, I guess I have to bury him in our new yard. The description on the real estate website calls it a “lush, green lagoon,” so I hope Frank will feel right at home in his final resting place. The backseat is ridiculously hot, and I scrape my lifeless hair into a high half-bun,half-ponytail with one of the several hair bands that are always hanging out on my wrist at any given time. I like the color of my hair—it’s kind of a honey blonde—but it’s so limp that it’s hard to do anything with it. At least my eyes are blue, or everything above my neck would be one giant canvas of blah. I roll my eyes. Usually when we take road trips, Mom and Dad print out an extra copy of the map for me to follow along, but surprise, surprise, they forgot it this time—on the biggest road trip of all. I convinced Mom to let me hang on to her iPhone so I can keep tabs on the little dot moving across the map… and play a little Angry Birds at the same time, with headphones, because the little bird sounds annoy Mom like crazy. Mom hates to be more than six inches away from her iPhone, but since it’s my birthday and they’re making us move from Georgia to Washington D.C., she’s being extra nice to me. I grudgingly hand the phone back to her. “I hope it’s not a seafood restaurant,” I mutter. Poor Frank the goldfish wouldn’t have cared for that at all. And besides, no seafood could ever be as amazing as the fried catfish from my favorite restaurant in Savannah—the beautiful city for which I was named. It’s a little goofy that I’m named Savannah and I’m from Savannah, but that’s okay. At least I can carry a little bit of my home city with me. Mom glances at my two-year-old brother, who has fallen asleep with a Garfield sticker on his upper lip. His name is Theodore, but he can’t pronounce the letter “r” so we call him Teddy. He’s old enough to get into every single one of my drawers, but he’s still so little that Mom defends him every time he does it. That drives me crazy. It took me ten years to perfect my only-child status after years of begging for a little brother and sister. Only after I finally stopped asking and began to appreciate the benefits of being an only child did Mom and Dad decide to have Teddy. By the time Teddy came around, I was over it, and now he’s just a slightly cute nuisance. I think they just wanted to wait until they had a free built-in babysitter. “Great.” I sigh and turned my iPod up louder. Only My Chemical Romance will do for right now. I need as much angst as possible. “So what are you listening to?” Mom asks just as I turned the volume up. Why is it that people always wait until the best part of a song to ask you something? I hit the pause button. Actually, I’m halfway through the playlist I’d made just for the trip, titled The Saddest Music I Can Think Of For The WORST Thing That Can Possibly Happen. I don’t want to tell her that because it would just make her feel bad, but this really is the worst thing that could possibly happen. I’m supposed to be spending my birthday with my two best friends, Katie and Tessa, but instead we’re driving toward a new city with a new school filled with people I don’t know. “Um, I don’t remember that,” I lie. I definitely remember. The Pattersons are butchers. The Smiths sell lumber out of their basement, and they all sleep with their lights on. Their cat secretly teaches algebra in summer school. “Twenty miles to the State line,” Dad announces cheerfully. “Another one?” I mutter. We’ve already driven all the way up through Georgia and South Carolina, too. “Nothing good,” I mutter again. “What’s that, sweetie?” Dad says, turning his head to hear me. “Lots of woods,” I fumble. “Dan, let’s stop for lunch once we get across the line,” Mom says. Dad is wrong. As soon as he rolls down the window at Wendy’s, the guy taking our order yells really fast and loud through the machine. His greeting sounds like it’s all one word. Teddy wakes up immediately and starts crying. “I’m sorry, sir. I can’t hear you,” the guy says breathlessly and just as fast as before. Dad orders for all of us, and it’s just my luck that they don’t even have the cherry fruit limeade that I always get from the Wendy’s back in Savannah, so I have to get the lemonade instead—not my favorite. As soon as we’re back on the highway, Teddy finishes most of his chicken nuggets and turns his attention to me. “Wanna pet Frank,” he insists. I wait for Mom and Dad to explain to Teddy in a nice way that Frank was no more, and that it’s nearly impossible to pet a fish anyway, but they’re arguing about something up in the front seat. “NAAAAAAAAAAAAAWH”! Teddy immediately begins wailing and throws a chicken nugget into the front seat. “Teddy, what’s wrong, honey?” Mom asks. She picks the chicken nugget off of her shoulder and puts it on Dad’s shoulder. I snicker. She grins at me. “Savannah tell me,” Teddy sniffles, wiping away a huge glob of mucus. “Wanna pet FRANK,” Teddy insists. “Distract him, Savannah,” Mom pleads. “You said since it’s my birthday I don’t have to play with him!” I cry. I sigh and pick up his stickers from the floor. So, this is my twelfth birthday: dead goldfish, screaming brother, stickers on my nose, and my left elbow just squished a cold chicken nugget. Happy, happy birthday to me. “I thought our new house was in Washington D.C.,” I exclaim to my parents the next day. Moving day is here, and we’ve just met the moving truck at the new house after checking out of the hotel. Good news: no seafood dinner for my birthday. Frank would have been quite relieved. I ignore my dad’s nerdy expression and focus on this news. So, we’re just living in some random suburb? I thought at least we’d be living near the White House. I thought we’d be seeing laws made on the way to the grocery store, and I’d be sitting next to Sasha Obama in Pre-Algebra. She’d invite me over after school, and we’d play with their Portuguese Water Dog and eat peanut butter on celery stalks while in the next room her dad had a meeting with the president of Italy. So I wouldn’t even meet Sasha? This was hard to swallow. “Do you want to go in and pick out your room?” Dad asks with a smile. He looks so hopeful that I’m not going to have another crying outburst that I decide to indulge him. I trudge into the empty house, dodging the movers who are bringing huge boxes into the house four at a time. The hallway smells clean and white—not like a home. I wonder if it’s the lingering smell of the family that lived here before us. Maybe their last name was Lysol or Clorox or their dad was even Mr. Clean. I climb the stairs and looked around the three bedrooms. I won’t take the tiny one, obviously, next to Mom and Dad’s room. Teddy can have that—he won’t know the difference. So, that just leaves the plain room at the front of the house. “I’ll take the master bedroom,” I tell Dad when I go back downstairs, disappointed at the variety of bedrooms. “Yeah, right,” he says, grinning. “Can I borrow Mom’s laptop?” I ask. “You know, to check my email and stuff,” I say. “There’s nothing else to do,” I plead. Dad gives in, and I sit cross-legged on the kitchen floor. Thank goodness the Internet is already hooked up, because otherwise there would be a major problem. I log into my Gmail and scan my new emails. I click first on an email from Aunt Kimberly—a twenty dollar e-gift certificate for my birthday from Hollister. Sweet. Aunt Kimberly always knows where kids my age like to shop, unlike Great-Aunt Millie, who—love her to death—still sends me gift cards to The Children’s Place. I haven’t fit into clothes from that store since second grade. I hold my breath and click next on an email from Katie. My heart races as the screen loads. Well, I guess you are in your new house by now. See I told you that I would have an email waiting for you. I miss you so so so so so so much and want you to know that you can definitely move back here and live in my house if you want to. Well, I haven’t actually asked my mom but I don’t see why it would be a problem as we are mostly at school all day anyway and you never eat very much at meals. Is the food different up there? I’m so jealous that you get to have your own Twitter account. Mom says that I’m allowed to follow you but I can’t post anything of my own. Boo. Oh well. At least I can see what you’re up to. I actually wrote this right before you left so by the time you read it you will already know my news already. But I do want to say again that I love, love, love Billy Randall and I want to be with him forever. And I think I probably will be because Maggie Reynolds moved too and that means I will be in his homeroom class in the spring and not the first person in the next homeroom class. All I can say is thank goodness for the way the alphabet is arranged. If that is not destiny, I don’t know what is. Are the boys up there cute? Well, I am really curious about what Virginia is like. My dad says that traffic is really bad around the Beltway, whatever that is, and when he had to go there on a business trip it took him an hour to go three miles. That sounds really bad, but as you can’t drive for four more years, I guess you won’t have to worry about it. Speaking of driving, my sister started driving school and my dad lets her drive when we go to the grocery store. I really didn’t know that someone could be so awful at driving, but I am truly terrified when she is behind the wheel. She drives like she’s texting the whole time. Me and Tessa may not have an older person to drive us to the movies, because I am not getting in that car with her unless I am on fire and have to go to the hospital. Well, I have to go to soccer practice now and I have no idea where my cleats are, so I better go. My heart gets that wrung washcloth feeling when I think about Katie and Tessa seeing a movie without me. I remember the first time our parents let us sit by ourselves at the Olive Garden. We went to a movie after dinner and looked around for people we knew. I remember cackling with them when we spotted Mr. Manx, our math teacher, with his wife, who had awful hair like a bird’s nest. I guess I never think of my teachers—especially math ones—as going to movies or going out in public at all like normal people. I sit there for a minute, clutching the mouse and staring at all of the unpacked boxes in the kitchen, and then I reach into my canvas Abercrombie purse—best Goodwill find ever—and dig out a pen and my box of notecards that I remembered to throw in there while the movers were packing up my stuff. After I take them out, though, I decide to put them back. Katie and Tessa make so much fun of me because I like writing letters, but texts and email are so boring sometimes. My dad says I’m an old soul, whatever that means. Not old enough to get highlights, according to Mom. Anyway, my notecards are from Great-Aunt Millie. Yes, Great-Aunt Millie of the unfortunate Children’s Place gift cards. They’re light pink paper with a big silver S at the top, and I’ve never used them except to write Aunt Millie a thank-you note for sending it. I am currently on the prowl for soccer-ball paper for when I write to Katie. I figure, in the meantime, it’s okay because she sees soccer balls every day of her life at practice. I have other fun stationery I use from time to time. I used to call it my stationary collection until my teacher at my old school in Georgia reminded me that “stationery with an e means letters for me. But stationary with an a means I never go away.” I wonder if she made up those things herself or if they have a special teachers’ class where you learn corny things like that. All I can say is that I wish I was stationary with a big capital A—back in her English class in Georgia. I have the perfect desk for my stationery. It’s painted white (by me), and my dad and I found it at a big garage sale at our church. There’s only one long, tiny drawer, and the rest of the desk is just a big blank space in the middle where my chair goes. My mom wanted to buy me this big fancy black desk where there’s a drawer or a slot for every single thing you own, including paper clips and CDs. I don’t need all that, though. Mom says my desk is impractical, but I think it’s beautiful. That desk is exactly what I need. I start my email back to Tessa, and try my best to sound more mature. I have to impress Tessa and Katie and make them wish they could live in Virginia with me. I now live in a serious, grown-up place where everyone wears suits and makes laws, so my emails need to sound like that. I regret that I have not written sooner but I just love our house so much that I can’t sit down and stop walking through the beautiful rooms. I look around my bedroom with its plain white walls and high old windows. They aren’t even the good kind of old, like something Thomas Jefferson would have had. They are just plain old. Our new home is a small, two-floor house in an old neighborhood with a tiny yard. All of the other houses in Virginia and downtown in Washington D.C. are super-old and really pretty. People probably went home to them after they signed the Declaration of Independence. They probably sat in front of their old fireplaces with a bottle of ginger ale and thought: Boy am I glad that whole Declaration thing is over. Now I can enjoy my beautiful, historic home. Only, I guess it wouldn’t have been historic then. Our house is one of the oldest houses in the state. It dates all the way back to the signing of the Articles of Confederation when really cool houses were being built. I pause and try to think of something interesting and awe-inspiring I’d learned in history last fall when we studied the first presidents, but I can’t think of anything but quill pens. Aaron Burr. They took all of their furniture, but they left this one desk that has Aaron Burr’s original feather pen. It uses actual ink to write with, unlike the ones we use today which I don’t think use real ink. In fact the realtor even said it’s rumored that George Washington may have lived here once. I pause again. I can’t believe I’m making these things up—although I think the ink part might be true, but there’s no way I’d actually send this email. I’ll keep it in my Drafts. This was just for fun, right? So, really, I can say anything I want to. So, I keep writing. I can’t wait to tell you more about it, but, for now, I have a lot of things to do tonight to get my brand new room set up to paint it lime green. The email is a great message—the kind of letter everyone wants to be able to write. The problem is, it’s probably only true for less than one percent of the population, and that percent does not include me. I don’t even know what I’m thinking as I hit the Send button on the email, chock full of lies about Aaron Burr and quill pens. Still, I go downstairs and help carry in boxes as if I’ve done nothing wrong. I play a game of Ants in the Pants with Teddy in the empty living room, help Dad unpack some of the kitchen stuff, and even listen politely as Mom describes how great my new school will be and how many new friends I’ll make—as if it will be that easy. I’m the perfect angel… except for that letter of lies waiting in my Sent Mail folder. If you’d like to take part in the LIBERTY BELLE book tour, please complete the form found HERE. 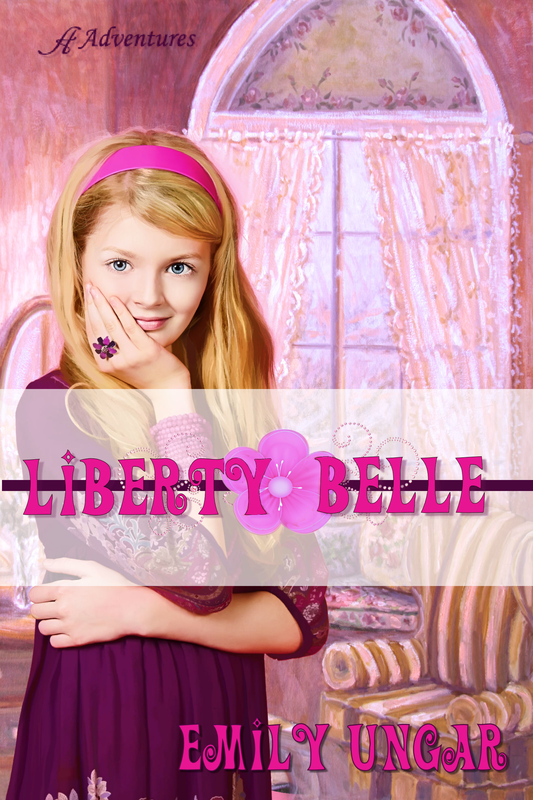 TEASER: the first chapter of LIBERTY BELLE! Your book is so fun. I’m ready to read it all over again! What would that make it…? Reading #12? Seriously. I cannot get enough of your writing, Emily! Emily, I read you teaser on the my phone the day it came out, but I just realized I never commented. I loved it and think you did a masterful job of getting into the head of a twelve-year-old girl! Congratulations, and I look forward to reading the whole book. Reblogged this on The Dusty Bookshelf.